I love when designers have a little fun with prints. And for Spring 2012, one of the cutest trends popping up is fruit-themed fashion! 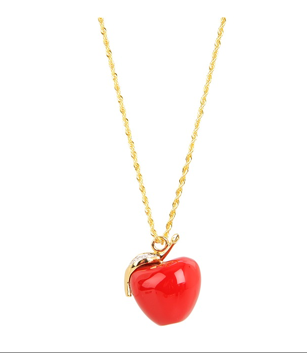 From delicious apple prints to sweet cherry pendants, designers definitely added a lot of whimsy to the season. (See, for example, looks on the runways at Jeremy Scott and Moschino Cheap and Chic, above.) Check out my favorite takes on the trend below. 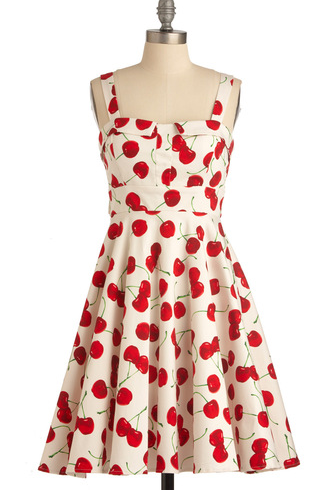 A 50's-inspired silhouette looks so fresh and modern with a delectable cherry motif. The flirty ruffles take this cutesy print in a much more sophisticated direction. Vibrant fruits make such a fun statement against bright green silk. Matte gold gives this pendant such a unique, antiqued look. The splashy print makes this perfect for a beachy getaway. You know what they say about apples and doctors. I have a feeling this pendant would do the trick. 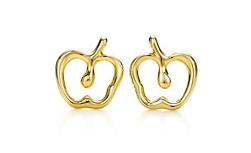 Make like Eve and take a bite out of an apple from the Tree of Knowledge in these gleaming 18k gold studs. In this dress, you'll be hard-pressed not to sing "I Heard it Through the Grapevine."